All the Restaurants in New York is a collection of these drawings, characterized by their appealingly loose and gently distorted lines. These transportive images are intentionally spare, leaving the viewer room to layer on their own meaning and draw connections to their own memories of a place, of a time, of an atmosphere. From romantic spots like Le Bernardin to beloved holes-in-the-wall like Corner Bistro, John Donohue renders people's favorite restaurants in a manner that captures the emotional pull a certain place can have on the hearts of New Yorkers. Featuring an eclectic mix of 100 restaurants-from Minetta Tavern to Frankies 457 and River Cafe-this charming collection of drawings is accompanied by interviews with the owners, chefs, and loyal patrons of these much-loved restaurants. "I love John's spare, romantic, quirky portrayals of iconic New York restaurants so much that I purchased over a dozen of his prints to hang around my office. These places come to define our lives in New York--that job right next to Balthazar, that boyfriend who lived above Prune, that interview that took place at '21' . . . They deserve this spotlight, this tribute, and I'm so pleased to see all of his work collected into book form so fans like me can flip through them wherever and whenever." --Amanda Kludt "Editor in chief, Eater " "Nostalgia-stoking, visually transporting, and appetite-inducing--All the Restaurants in New York is an emotional trip down memory lane for those of us who count our favorite restaurants as cherished personalities and members of our family." 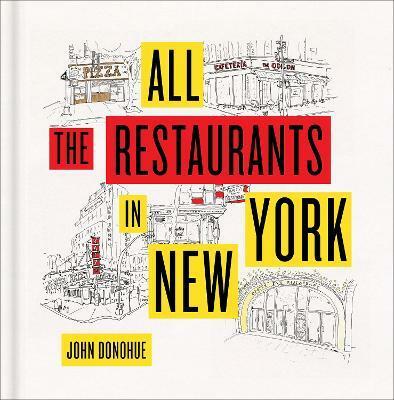 --Danny Meyer "CEO of Union Square Hospitality Group, founder of Shake Shack, and author of Setting the Table " "John Donohue is the Rembrandt of New York City's restaurant facades. His collection is an invaluable, evocative guide to the ever-changing, slowly vanishing landscape of the city's great dining scene. It belongs on the bookshelf of every devout chowhound and fresser." --Adam Platt "Restaurant critic, New York magazine "